Ossoko Draconsha, literally “Dragon’s Defeat” in the tongue of lizardfolk, may well be the conceptually most unique settlement in the whole series of village backdrops – if the name and dominant lizardfolk population you can glean from the settlement statblock are not clear enough: This is a lizardfolk village, but one unlike those you’d know from various modules: Ossoko Draconsha’s existence is ultimately thanks to the noble sacrifice of one woman, the paladin Kellesta, who united the lizardfolk to overthrow a particularly nasty black dragon. Mortally wounded, she fell in the battle, but the slain dragon’s skull remained as the creature’s body dissolved in acid. Sensing the work of powerful spirits at work, the lizardfolk took it upon themselves to consecrate the place and declare it neutral territory, soon figuring out that the sanctified skull can be used to conjure forth Kellesta’s spirit in times of need, turning the acidic pool temporarily into a clear water of healing properties. Sporting thus an amount of non-lizardfolk settler, the place has prospered, though the uncommon demographics of the village necessarily put a refreshingly unique spin on the local color provided – from industry to rumors and nomenclature, the novel suffuses this book. Beyond the obligatory whispers and rumors as well as the potentially adventure-inciting events, Ossoko Draconsha also sports no less than 3 fully detailed statblocks – a CR 6 lizardfolk barbarian, a CR 4 halfling rogue and a CR 6 elven conjuror. I applaud the number of these sample NPCs, though I frankly wished the builds themselves were slightly more complex. As a bonus, though, the paladin’s spirit, codified as a sacred coterie loci spirit (yes, that mean Occult Adventures-support, though you do not need the book!) does offset this otherwise extremely nitpicky complaint. John Bennett is perhaps one of the most under-appreciated freelancers currently out there: There are not that many authors out there that have his talent for weaving atmospheric, compelling yarns that sport their hooks on their own, that manage to make a place or module run by mere virtue of PC-insertion. 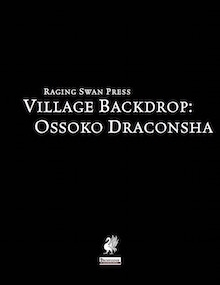 Ossoko Draconsha may have an odd name, but it is all awesome and, from the get-go, does feature truly intriguing and captivating adventuring options; due to its unique nature and location, it makes for a great haven or neutral ground in extended swamp-sojourns and e.g. would allow for PCs to easily learn more about the background of a given locale sans risking their immediate lives – this one begs to be asked in conjunction with unique offerings like TPK Games “The Fen of the Five-Fold Maw” and similar modules, while the loci makes for a feasible reason to make this the end-point of a quest with a plethora of potential complications. This village is unique, cool and exceedingly well-written while also sporting cool visuals – and what more can you ask of such a book? My final verdict will clock in at 5 stars + seal of approval. You can get this cool Village Backdrop here on OBS and here on d20pfsrd.com’s shop! You can also get a kind of subscription for Raging Swan Press’ books and help them pay their freelancers better wages here on their patreon!